The cliffs between Southbourne and Boscombe are not that high (about 95 feet according to my GPS). All the same, they draw numberous paragliders who manage to get airborne from here and float up and down the coast. Because they are so close to the ground it is possible to get some great shots of them with their colourful canopies and their gossamer-like lines. 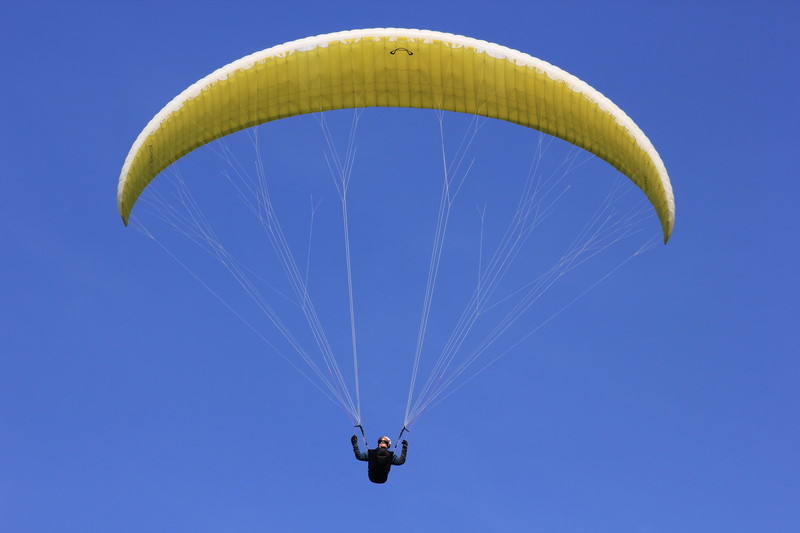 I have never been paragliding but it is something I’d love to try one day. As for the cliffs themselves, there are goats living there. Yes! There is an area of cliff which is fenced off and which is a permanent home to goats. 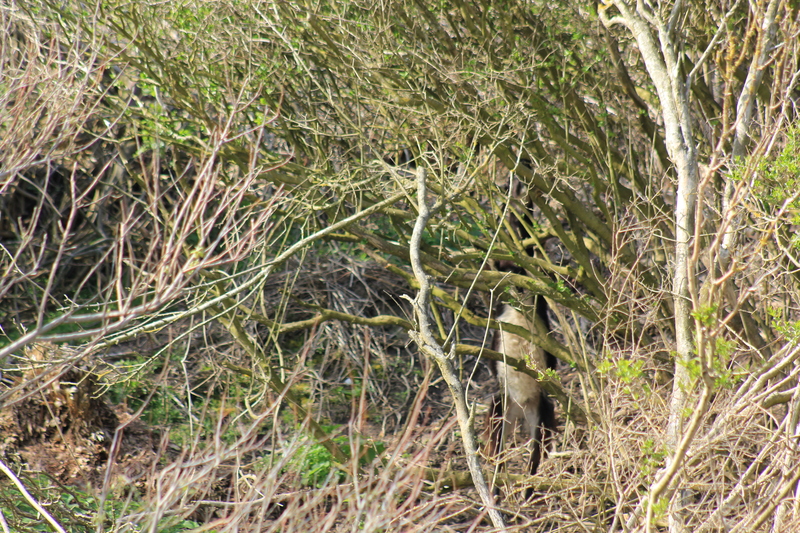 As we walked into Boscombe there they were, munching on the cliffside scrub. I decided that perhaps I should brush up on my accomplishments and come back to this another time. Either that or those goats need to eat a bit more scrub. 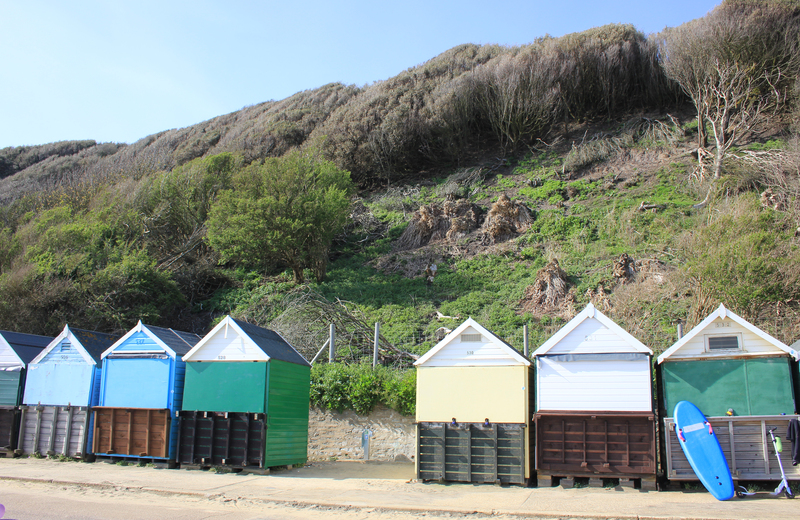 I went off to look at the brightly coloured beach huts instead. 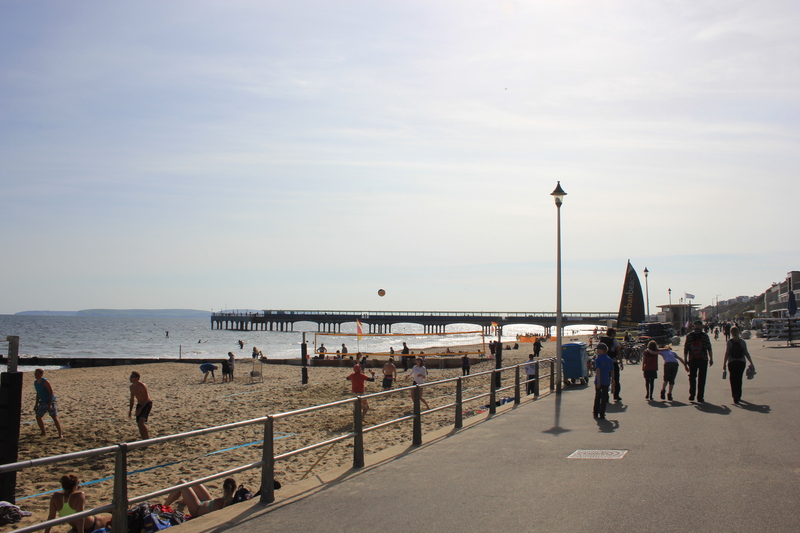 From this point it was only a short walk to Boscombe Pier. 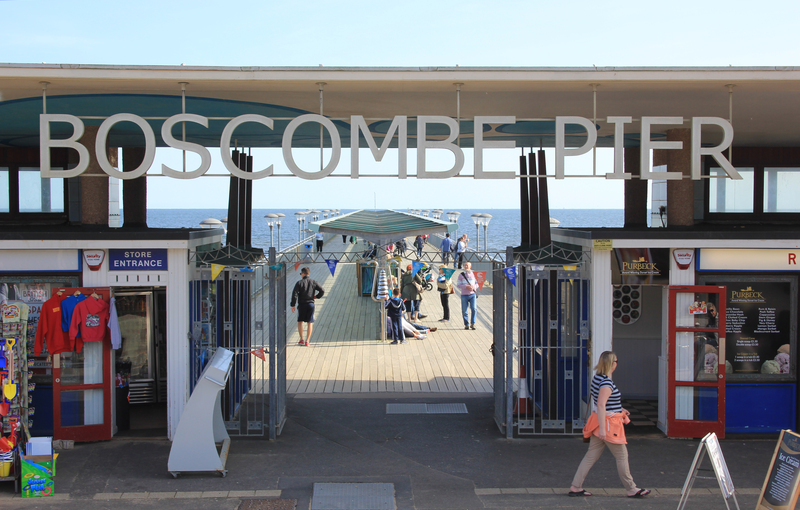 The gates to the pier beckoned us in, but we decided to save our walk along the pier for the next time. Stage 71 of our walk around the coast of Britain ended here. This entry was posted in Dorset and tagged beach huts, Boscombe, coast, Dorset, goats, paragliding, pier, travel, walking. Bookmark the permalink. No, they’ve always been on the ground when I’ve seen them. I think this one was stood up on its hind legs trying to nibble something. Ah, Boscombe. Principle produce: shy goats, paragliders and helpful mammals (I was born there). I twitched when I saw you had tagged it as Dorset. Which it is. But it was Hampshire back then. And part of me still regards that change with all the tantrum-throwing denial of the four-year old I then was. By many definiions (it’s an imprecise term) reaching Dorset if it is Dorset also means you’ve reached the West Country. So congratulations on that! Obviously, I meant I was a four-year old when they moved the border, not when I was born. Tsk. grammatical imprecison; I shall go combust with the shame of it..
Not all Boscombian mammals are helpful, Ju, otherwise those pesky goats would have moved to open space and allowed me to get a good picture of them! I never knew Boscome was part of Hampshire once! Yes. Christchurch and Bournemouth were once Hampshire, whilse Poole was Dorset. When the towns largely merged together it was decided (rather sensibly, I think) it made sense to have them part of the same county rather than a county border through the middle of a conurbation. Hence Bournemouth and Christchurch boroughs became part of Dorset. 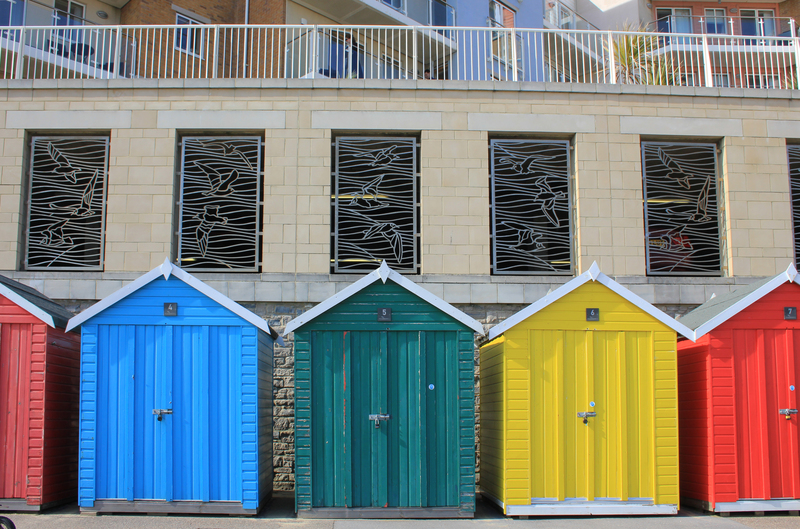 Ah, the beach huts and numbers. Yes i can be guilty of odd ideas when walking the coast, i was traveling in the opposite direction from Bournmouth and on passing beach hut no 1 and noticing the numbers climbing fast i wondered (for no apparent reason) if there was a beach hut number 1066, and yes there was plus a lot more. just how many in total i don’t know, did you count them by any chance? Cheers J.P. (who will return to passing beach huts as soon as time allows).